WHERE IN THE WORLD: We’re not too sure how it happened, but this week, Santa Barbara lays claim to two of the hottest tickets on the gypsy folk rock scene. (They have a scene, right?) The whole worldly party kicks off this Saturday night at Velvet Jones (423 State St.) when New Noise, KCSB, and The Indy team up to present S.B. Balkan lovers oso as part of a full night of stellar, media-approved music. Since they hit the road last year, the oso guys have been keeping plenty busy, touring around the state and country with their one-of-a-kind blend of post-rock and gypsy two-step. Expect high energy and a huge turnout for their big hometown return. Also sharing stage time: Pilar D-az, Franklin for Short, Le Petit Protest, and Raining and OK. Call 965-8676 or visit newnoisesb.com for details. And on Tuesday, October 13, L.A. four-piece Fishtank Ensemble and Oakland’s Brass MenaÅ¾eri bring their frenzied take on Eastern European folk tunes to SOhO (1221 State St.). With Fishtank’s manic speed and Latin infusion and MenaÅ¾eri’s big-band take on classic street performance fare, the night is guaranteed to get hips a-swayin’. The newly formed Santa Barbara Balkan Band will open the show. For tickets and info, call 962-7776 or visit sohosb.com. OLD FRIENDS, NEW PLACES: In local-gone-global news of a different variety, this month brings three new (and great) albums from former Santa Barbara music-makers. To the north, Portland avant-garde popsters Church-made up of UCSB alums Christof Hendrickson and Brandon Laws, along with bandmates Reechard Laws and Lane Barrington-are dishing up some of the finest tunes and most frenzied live shows I’ve checked out in ages. The guys recently released the delightfully frantic Song Force Crystal (available on iTunes) and currently are touring throughout the country (they played Muddy Waters on Wednesday). Visit independent.com/church for more on the band. To the east, New Yorkers The Morgues are fast on their way to buzz-band stardom thanks to a glorious debut EP, Are Fast Cars. The band’s fluctuating lineup includes S.B. transplants David King, Daniel Lewis, and Asher Simon, as well as a motley crew of multi-instrumentalists, and their three-song sampler draws immediate comparisons to Tom Waits, Dr. Dog, and an early incarnation of the Stones. Check it out for yourself by visiting ashleysdollarstore.com. Also on shelves now: Former Coral Sea-er Austin Beede’s Brooklyn-based outfit Alberta Cross recently released their debut LP, Broken Side of Time. The album is chock-full of the band’s signature loud and chugging guitars and howling high-pitched vocal crescendos; a must-have for any hard rock fan. GO BIG OR GO HOME: If you’re like me and abide by the “more the merrier” school of thought when it comes to music groups, well then, this might just be your lucky week. 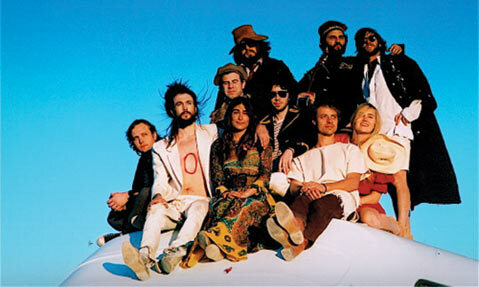 This Saturday, October 10, SOhO welcomes L.A. neo-hippies Edward Sharpe & the Magnetic Zeros as part of this weekend’s New Noise music conference. Boasting 10 members, soaring melodies, charming clap-alongs, and some of the best uses of sonic overload I’ve ever heard in recorded form, this promises to be a show for the history books. Don’t believe me? Check out their jangly, trumpet-filled performance of “Home” on Letterman (available on YouTube). We dare you not to make the Arcade-Fire-meets-Johnny-Cash-and-June-Carter comparison. For tickets and info, call 962-7776 or visit newnoisesb.com. ONCE BITTEN: Also this week, Club Mercy returns with another can’t-miss lineup this Thursday, October 8, at Muddy Waters Cafe (508 E. Haley St.). 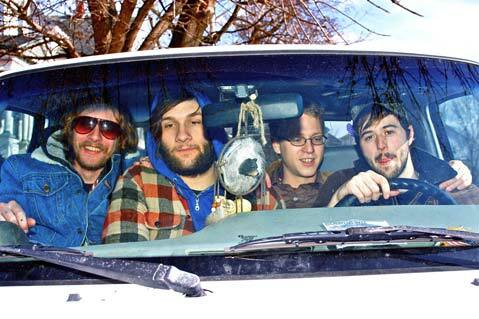 Starting around 8 p.m., the coffee shop hosts an all-ages onslaught of music from Rhode Island folk giants Deer Tick, as well as our own heavy hitters Watercolor Paintings and Tall Tales and the Silver Lining. For the unacquainted, Deer Tick’s sound is a heavenly mish-mash of bourbon-soaked blues, twangy Appalachian country, and good, old-fashioned, raucous rock ‘n’ roll. Call 966-9328 or visit myspace.com/muddycafesb for details.